The Indian Air Force is all set to induct four Chinook strategic heavy-lift helicopters into its fleet on March 25. Defence Minister Nirmala Sitharaman is expected to preside over the event at Chandigarh. The heavy-lift helicopters will be used for transporting troops, artillery and other heavy equipment along with fuel, to far flung areas along the border. These four helicopters will join the IAF base at Chandigarh, which has transport and helicopter fleet that caters to the high altitude operations of the armed forces. The first batch of four Chinook helicopters arrived by sea at Mundra Port in Gujarat on February 10. The Indian Air Force currently has 15 Chinook helicopters on order. Chinook will join IAF's 126 Helicopter Flight unit that operates the last batch of Russian made Mi-26 choppers, which would be phased out soon. India had, in September 2015, signed a $3 billion contract for the purchase of 15 Chinook and 22 Apache attack helicopters. Additionally, six Apaches were cleared for purchase for the Indian Army in 2017. Fuselages for this Army order will be produced by Tata Boeing Aerospace Limited, the joint venture between Boeing and Tata Advanced Systems in Hyderabad. "Four Chinook has been delivered. First lot of Apache attack helicopter will also arrive in India soon in a couple of months," said a defence official. 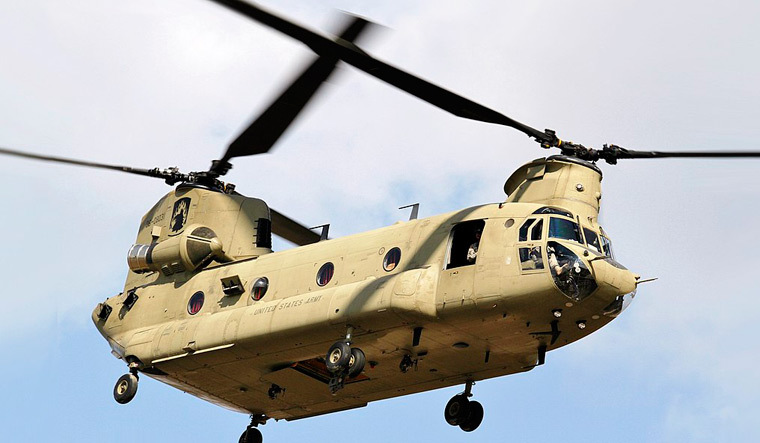 Acquisition of Chinook heavy-lift helicopter is set to give a significant boost to infrastructure development along the borders, as the helicopter has the capability to ferry heavy cargo like road construction equipment over difficult terrain. "The ahead-of-schedule arrival of the Chinooks validates Boeing’s commitment to delivering on its promise of modernising India’s defense forces. Through its current partnerships with Indian Air Force and Indian Navy, Boeing has ensured high rate of mission readiness and increased operational capabilities," Boeing said in its statement. After Chinook, Apache attack helicopter will be the major induction for the IAF. Called 'flying tanks', Apache attack helicopters could play a major role in tank battles for India Army, especially on western front with Pakistan. Fitted with air-to-air missiles, Apache helicopters are capable of detecting 256 moving targets and engaging them. Apache, a twin-engine helicopter is operated by two pilots. With its array of modern electronics, Apache is considered to be one of the most advanced combat helicopters. Apaches were involved in missions during the 1991 Gulf War between the US and Iraq and then in Afghanistan. And Indian army will be the 14th country to operate these attack helicopters.